Hot Springs - See Angostura Resort - Privater Log Cabin! Schleichen sich auf Ruhe und Frieden in Ihrem eigenen gemütlichen, privaten Blockhaus auf 2 + Acres entfernt durch Sheps Canyon bei Waters 'Flanke am NW-Spitze vom Lago Angostura in der südlichen Black Hills versteckt, nur 15-20 min. von Hot Springs und 1 Stunde 15 Minuten von Rapid City. Schöne Sterne und Blick auf den See! Nur 10 min. zu Fuß zum See. Wenn es sich um wirkliche Handlung, die Sie suchen, über den See zum Erholungsseite und finden Sie einen wunderschönen Sandstrand und Spirituosen & andere Erfrischungen! Ein Kingsize-Bett und ein Queensize-Bett. Komplett eingerichtet. Riesige Deck! Lounge auf dem Deck in der Dunkelheit und teilen Sie die Sterne - Sie haben noch nie so ART! Lassen Sie den Frieden durchdringen die Seele und Geist! GENIESSE DAS LEBEN! Besuchen Evans Plunge Healing Waters, Mammoth Site, Mount Rushmore, Wild Horse Sanctuary, Deadwood, Sturgis, und die Badlands und so viel mehr Spaß zur Auswahl! Great place, tucked away in the Black Hills, quiet, incredible views, nice cabin, Linda is easy to communicate with, great to work with. I definitely would consider staying again. Brian, thank you for the kind words about our wonderful cabin. We are so happy it makes others more happy. You were a pleasure to host! I dropped a note in the mail to you yesterday. Thanks again! We loved this quaint escape in the hills. It gave us a constant base to travel to all the local attractions including Badlands, Mount Rushmore, Devils Tower, Mammoth Site, Casade Falls, Custer State Park, Evans Plunge, Deadwood, Wind Cave, Jewel Cave, and Crazy Horse. This two bedroom with kitchen/living room looking out into the Angostura Reservoir was perfect. Thanks for a wonderful week! Thank you Lynn, we are happy you enjoyed your stay! We hope you can come back. Thanks for allowing others to glimpse into this cabin world. We had a wonderful experience! Saw wildlife in the front yard each night! Linda was wonderful to work with! Excellent location, wonderful host, overall a perfect stay! My wife and I came to this cabin for a week never having been in the area, and we couldn't have been happier with our stay! The cabin would be a perfect size for 2-4, and the location is nothing short of incredible. The 6 mile drive through the canyon to the cabin has spectacular views at every turn. We had dinner on the deck watching the lake at sunset. It is about a half an hour away form Wind Cave NP, and there's no shortage of fun, outdoor things to do around the area. Linda was incredibly attentive through the whole process, answering all of our questions beforehand, texting us the night we arrived, and responding within minutes whenever we had a question about the cabin. Everything was clean and prepared for our stay. We could not have been happier! 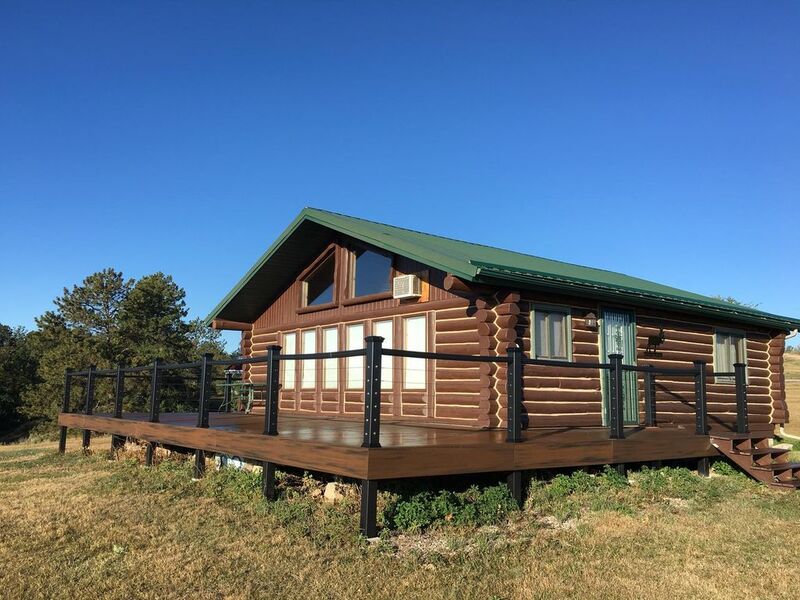 If you are looking for an affordable, remote place to stay in the Black Hills with spectacular views, look no further! Thank you kindly! We strive to keep it a little slice of heaven! We too enjoy it all. Thank you for your comments and remarks, and TAKING THE TIME to share so others can really get an outsider's opinion! My three boys and I stayed here in June 2018. We had many places to choose from on the VRBO site, but this property won out of the rest. We loved the quiet and rustic atmosphere this place offered. We went fishing at the reservoir every day and we caught Walleye, Small Mouth Bass and Panfish. Walleye and Bass liked the shallow runner Shad-Rap lures. This property is very close to Wind Cave and the Mammoth Site which were really amazing attractions. Having a burger and ice cream at the Dew Drop in Hot Springs is a must! Great people and great food! Rushmore Cave and Mt Rushmore are no more than an hour from here. We spend a few days there and also panned for gold at the Broken Boot mine in Deadwood. We had a fantastic vacation and we thank Linda for the hospitality!! We will make sure to stay here again when we are in SD next! !